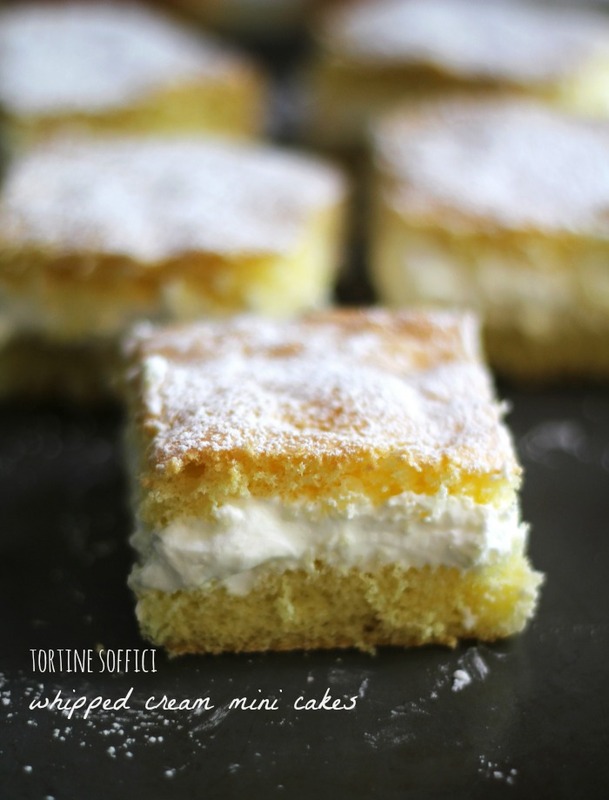 This last week we celebrated Festa delle Donne-International Women’s Day, and I didn’t make these Tortine Soffice-Whipped Cream Mini Cakes for any ladies that I know. They were made just because. Just because my kids want a little snack after school and besides my usual something fast and easy with ripe bananas or apples, I decided to go a little different. Let’s face it, my kids never turn down freshly whipped cream. I really don’t know anyone that turns it down! In Italy, merenda time is such an important part of the day. The merenda is the snack that you have in between your very large lunch in the afternoon and the dinner that usually happens very late in the evening. In the summertime, dinner sometimes happens around 9PM. If I’m home and back on my schedule, that’s when I’d like everyone to be already asleep (even in the summertime). So that in between lunch and dinner time is when everyone has some sort of a merenda. Usually it’s something savory. Occasionally my mother-in-law will have a freshly baked cake or sweet and the kids will enjoy a little bit of that. But most of the times, the merenda is some fabulous bread that Teresa just baked and some freshly sliced mortadella or prosciutto (crudo or cotto)and that will hold off the gang until dinner is finally ready. When we first get back to Italy in the summer time, it takes a week or so for my stomach to adjust to the new schedule again. I normally don’t eat quite a large meal when I’m alone at home. And I really don’t ever eat right before bed. But you get used to it and you walk so much more than you do back at home, so it all works out. There are also meals that are not rushed and last over an hour. I had one of those the other day with my in-laws who are visiting us from Italy. I was at lunch with them and one of our friends from Calabria. They are all grandparents (and Calabrian) and they have all seen it all. The conversation somehow switched from talking about making homemade Calabrian sausages to the topic of some cousins that have died. My mother-in-law started in with the story of her cousin’s husband that was taken away too suddenly by a nasty cancer and it then proceeded to how the last person that left the wake was another cousin. He arrived home that evening to his mamma’s house, went to bed, had a heart attack in his sleep, and died. It was all very morbid and our friend Aldo had some stories to match these recent deaths in my mother-in-law’s family. A part of me wanted to get up and leave the three of them discussing sausages and sudden deaths in Calabria, and the more wise part of me decided to not be rude and to learn something from the moment. You can’t always rush lunch. Sometimes you have to sit even for a full hour or more and savor every thing you are eating, and not just when you are in Italy. The other thing is you won’t always be privy to light conversations and you may have to just sit back and listen and witness your elders sharing history and hope that one day you will have people sharing your stories. This cake was something I put together pretty quickly with ingredients I had here and it was decadent enough with the whipped cream for the kids to think we were celebrating something. Make your own whipped cream. It takes minutes to do and there is nothing strange added to it. You could flavor the whipped cream as you like it. I only added a touch of vanilla, but you could add more if you like a stronger flavor. 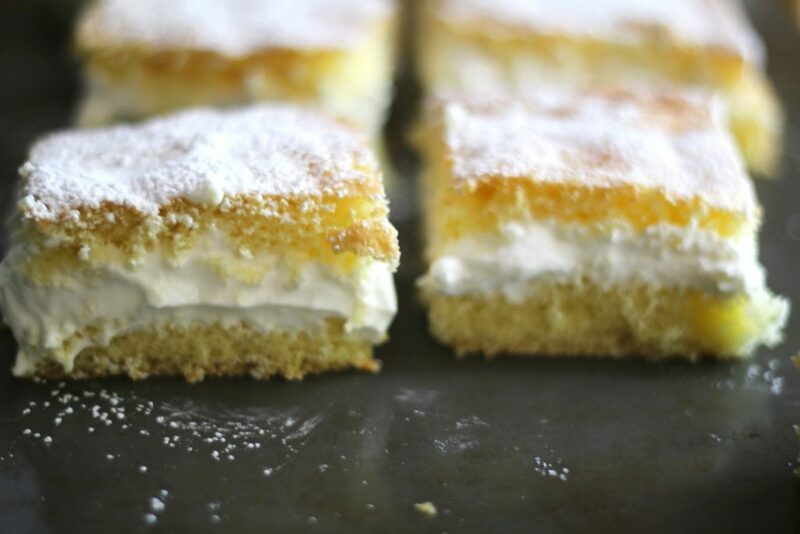 These soft and light cakes are filled with fluffy homemade whipped cream. 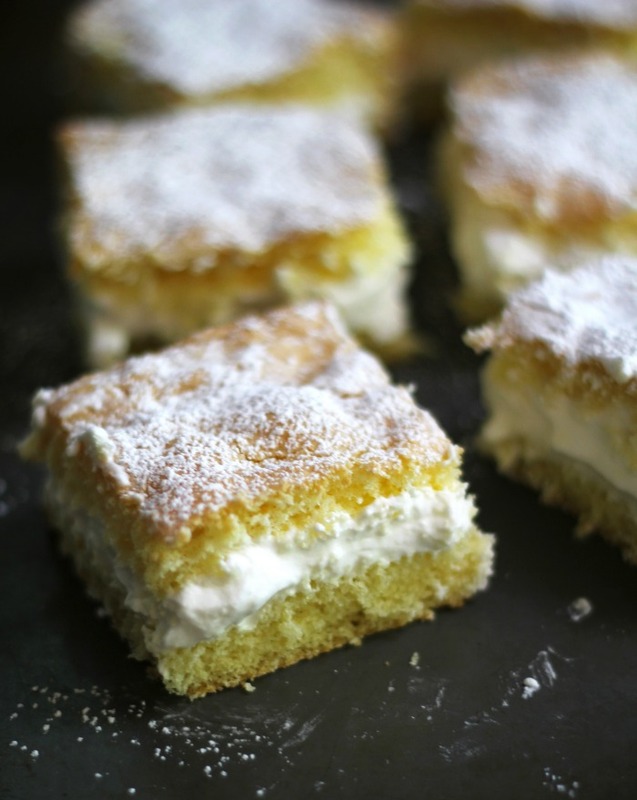 In Italy, merenda is all about the snacks and this is the perfect snack cake to enjoy with a hot cup of tea or coffee. Preheat the oven to 350 degrees. Grease and flour (or spray with baking spray) a rectangular cake pan (I used a 9x13). Beat the eggs all at one time with the sugar on high speed until it is nice and frothy. Beat in the vanilla. Pour the batter into the prepared pan. Bake the Pan di Spagna for 30 to 40 minutes, until it is well risen and feels firm when pressed gently with the palm of the hand. Use a skewer to make sure the center is no longer wet if you have doubts about it not being ready. While the cake is baking, prepare the whipped cream. Chill a medium sized metal bowl in the freezer. Remove bowl from the freezer and add the heavy whipping cream to the bowl. Using a hand mixer on high speed, whip the cream until soft peaks begin to form; gradually add in the 1/4 cup of confectioner’s sugar. Continue to beat the whipped cream until it is thick and velvety. (about 1-2 minutes). Don’t over beat or you will have butter. Keep in the refrigerator while the cake is baking. Check the cake after the first 20 minutes of baking to make sure it isn't getting too brown. Every oven is different. If needed, lower the temperature to 325 for the rest of the baking time. Let the cake cool on a rack. 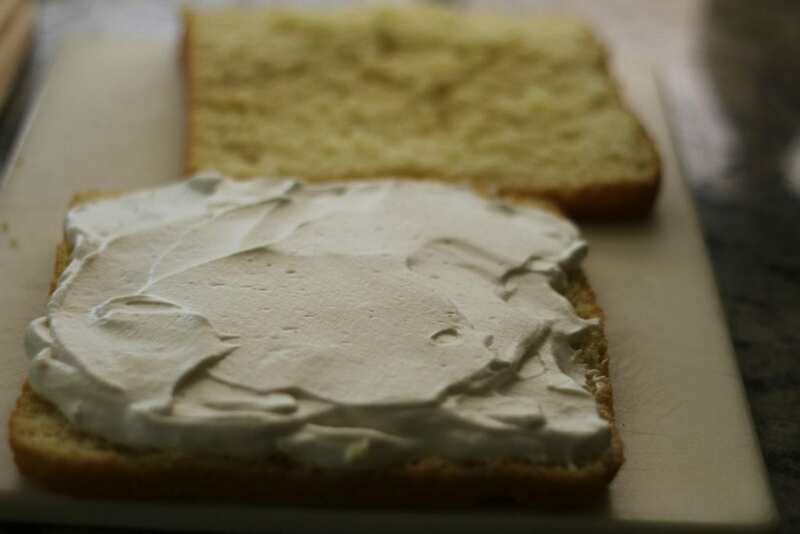 When the cake is cooled, cut the cake in half and spread the freshly whipped cream onto one layer. Top with the next layer. 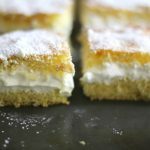 Carefully cut into the individual pieces and with dust confectioner’s sugar on top. This cake looks absolutely divine! These look like perfect little treats! Slowing down is still something I'm trying to learn. With kids, work and life in general, it's so easy to get wrapped up in a tight schedule. Thanks for the reminder and for these great mini cakes. I definitely wouldn't turn down anything with fresh whipped cream either! They look so yummy! How pretty! I am hosting a shower next month, and these would be perfect. Sometimes long meals are the best. Forces us to slow down and relax a little. We spend so much time running around and stressing out, no matter the conversation long meals, help ease that. 🙂 These little cakes… i could sink my teeth into them! This was a very interesting read about Italy and gave me some great insight! This cake looks like perfection! This is the perfect looking dessert! Fresh whipped cream is one of the perks of life! I never hear of this cake…But man do I want a big piece…looks and sounds delicious! I think slowing down and listening is something we all need to do more of! The look outstanding and I totally agree. Taking time to sit back and relax and enjoy life… We all need a little more of that. I never, ever turn down freshly whipped cream! I'd be totally happy with these! This recipe was a bit difficult to prepare but was well worth the effort. what kind of camera do you use for your photos? they look great!